Posted on January 6, 2014	by Smiling Road Warriors! 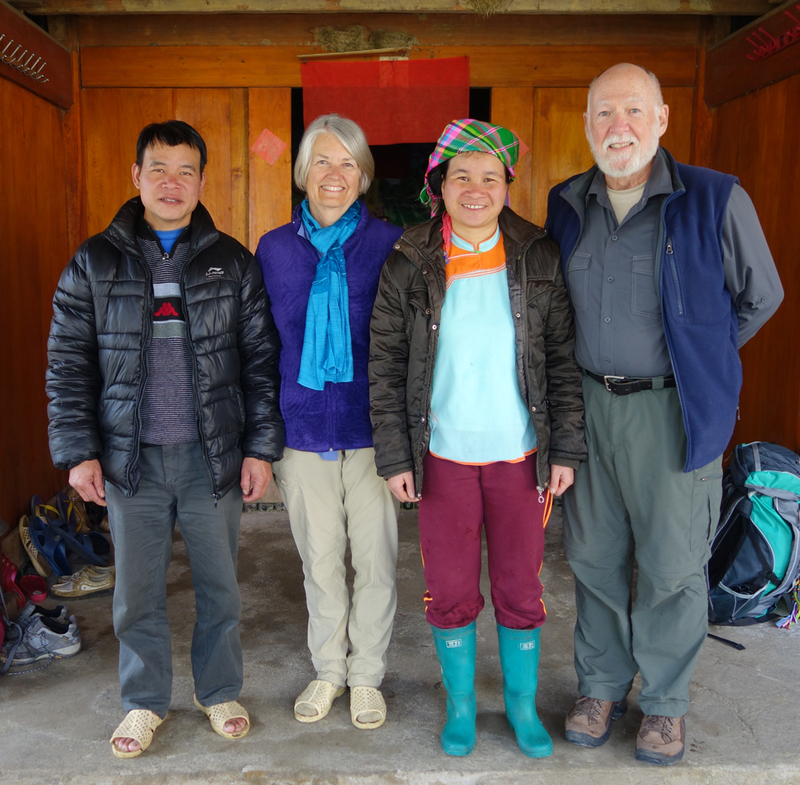 An overnight train ride to Sapa in the Northern Vietnam Mountains. The old sleeper-cars on the Sapaly Train reminded me of some of the old movies we used to watch: remember those ancient narrow-gauge railroads, like in India of the Raj, where the cars swayed back and forth and time seemed to be dictated by the clicity-clack of wheels riding short rail lengths? 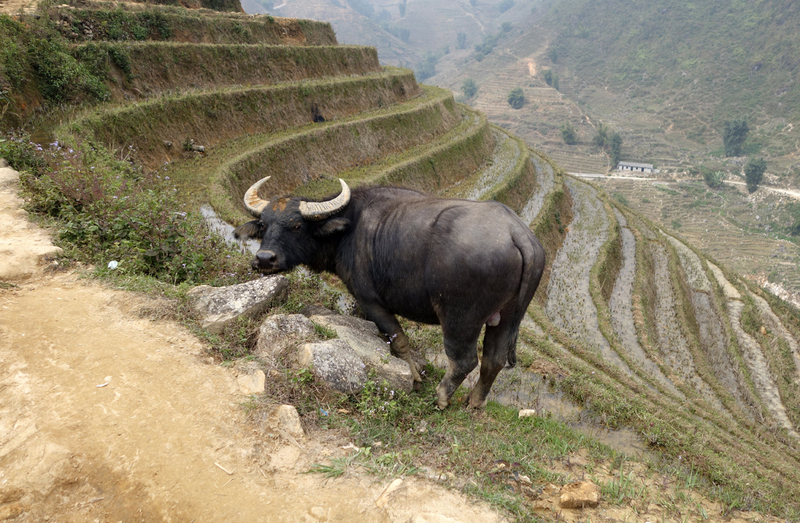 Well, we were indeed rocked to sleep by this rhythm, and arrived in Sapa only 3 hours late, and ready for some trekking (OK: so this isn’t the Swiss rail-system!). 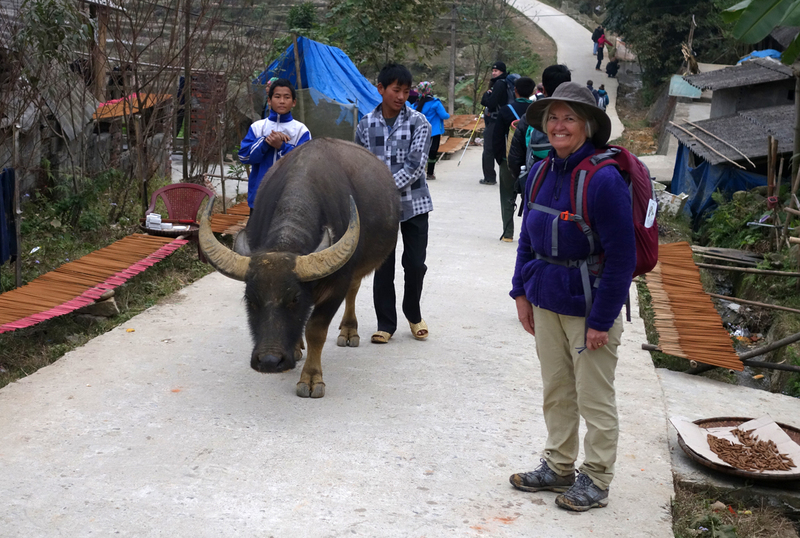 Because of recent cold weather up here in the north of Vietnam (it had snowed last week and the village we were to go to still had some snow) our hiking route had been changed; so we trekked north out of Sapa rather than to the east and south. We originally were to trek to villages off the road system, visiting some very different tribes. 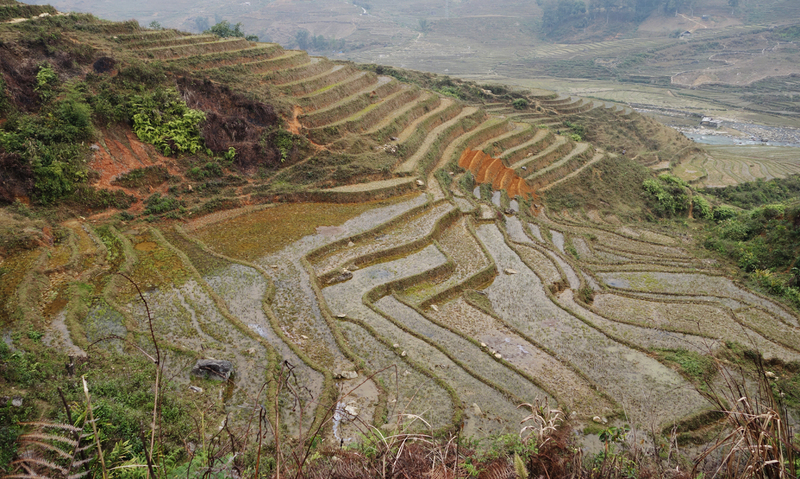 Instead, we had a pleasant hike to Ta Van village and the terraced rice fields we crossed on the way there were mesmerizing. Because of the low-level clouds in the valley this day we couldn’t see much of the large mountains. This was the beginning of the dry season in the north so most of the rice fields had already been harvested. From some pictures we have seen it looks like the premium time to visit, at least for viewing verdant fields, would be spring-time. 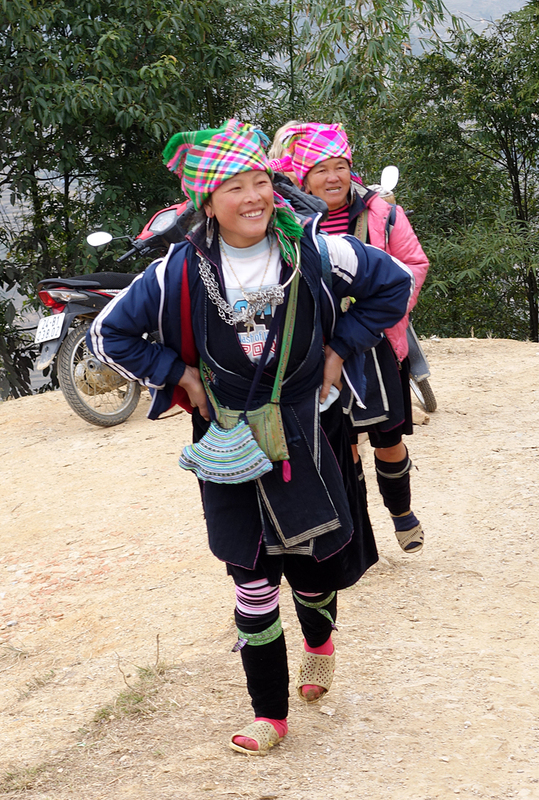 These lovely Hmong women follow trekkers on their treks, and then want you to buy something from them. Not pushy, but they can be persistent. Rice paddies everywhere. Note the rust-colored ones in the middle of the image: these were just reconstructed after a large rainstorm had washed out the center sections. 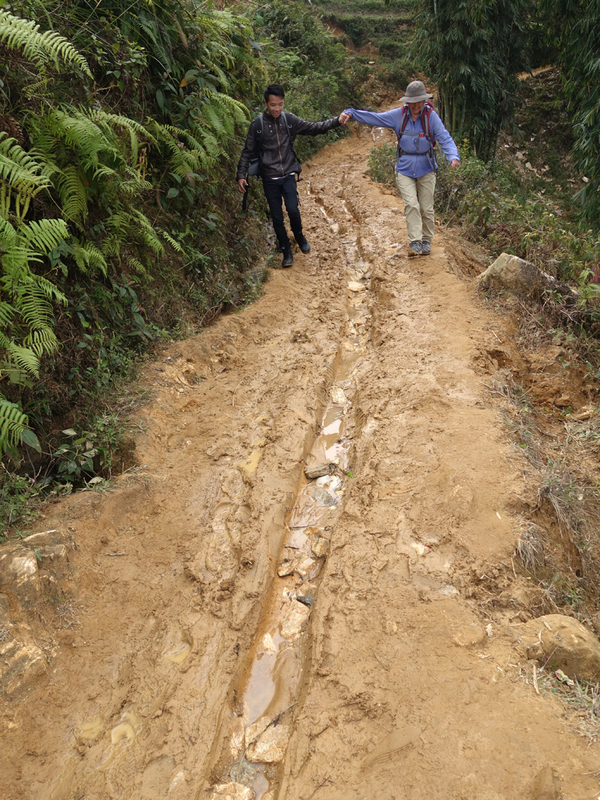 Building a road the local Vietnamese way. 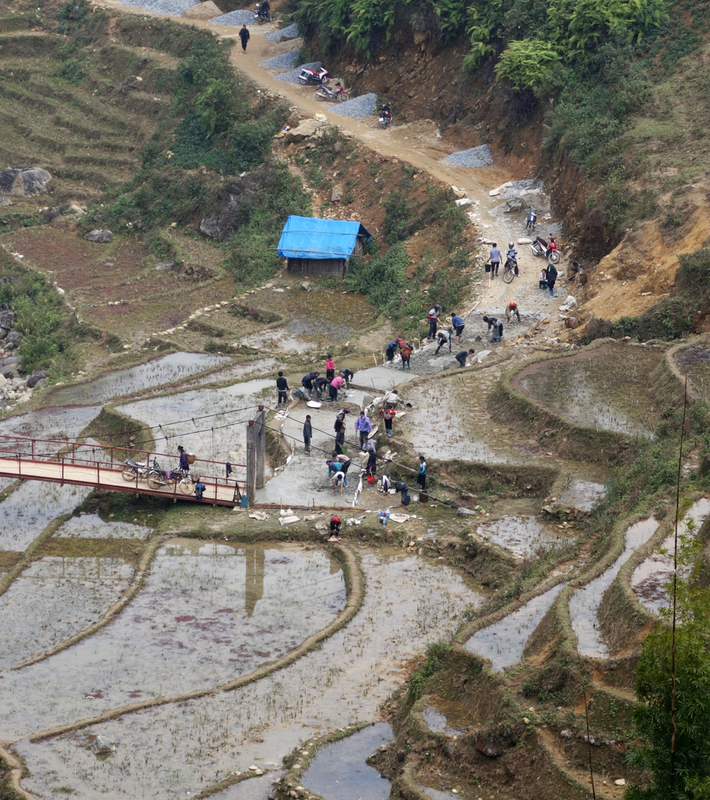 If the government won’t do it, villagers pull together and build it themselves. Quite a demanding effort, but it works! Water Buffalo are just up here munching on left-over greens this time of year. Harvest is over, so they roam. 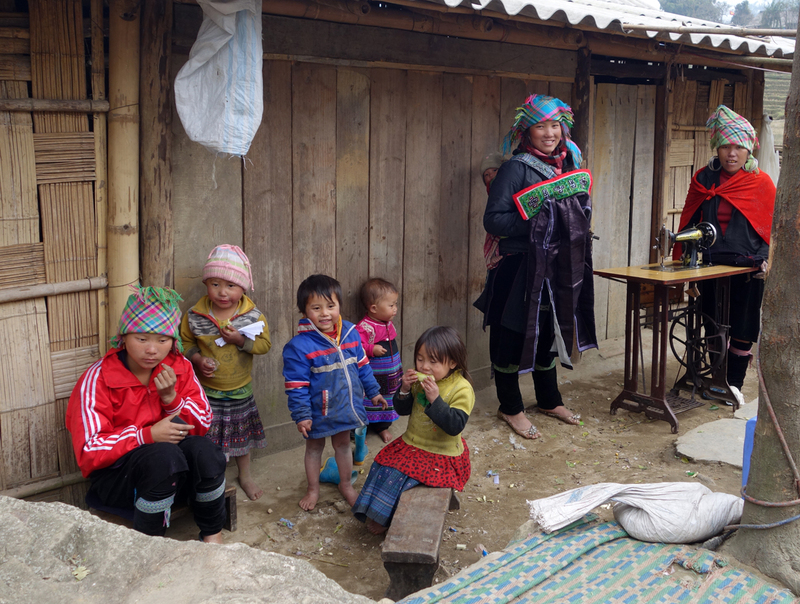 Women and children along the trail in one of the Hmong villages — notice sewing machine in the yard. Many of these have been donated by foreign NGO’s, and are widely in use. You never know who you’ll meet on these roads. Evie tends to give ’em a W I D E berth! The reddish ‘sticks along the side of the path are drying incense, made by a local entrepreneur for sale to passersby on their way to Buddhist religious celebrations. 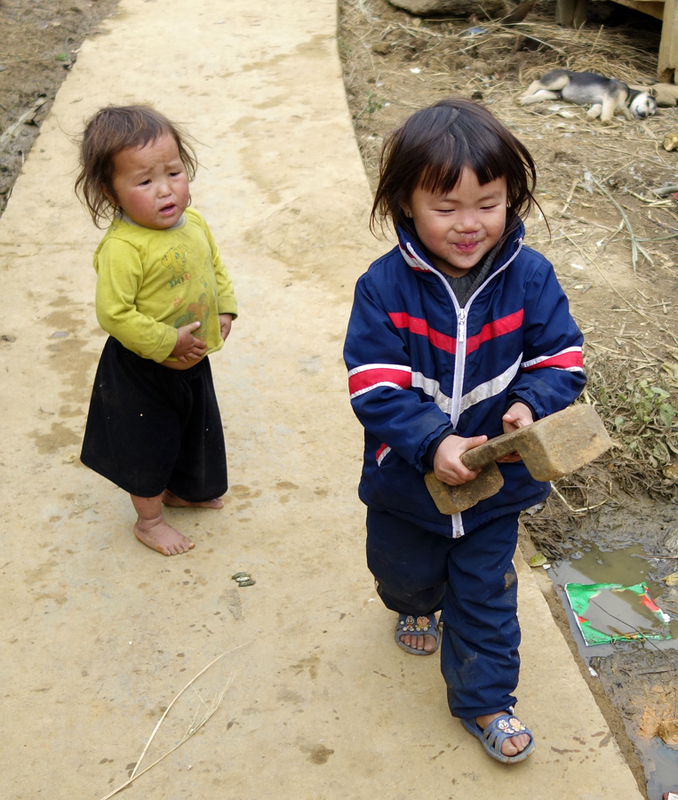 Children in the village — he just took away her stool ! Making a new toy. 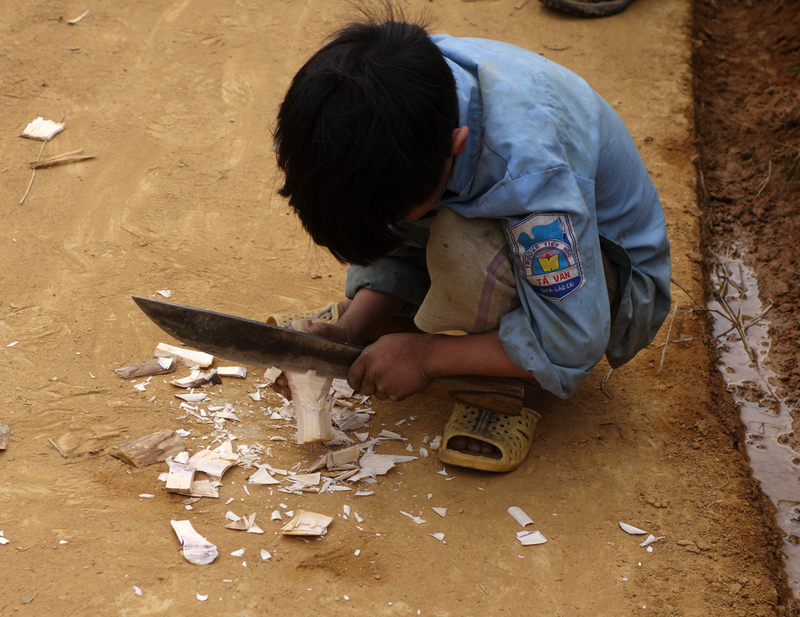 This little guy was only 5 years old — they use most of the implements their parents use, at very young ages in the mountains. 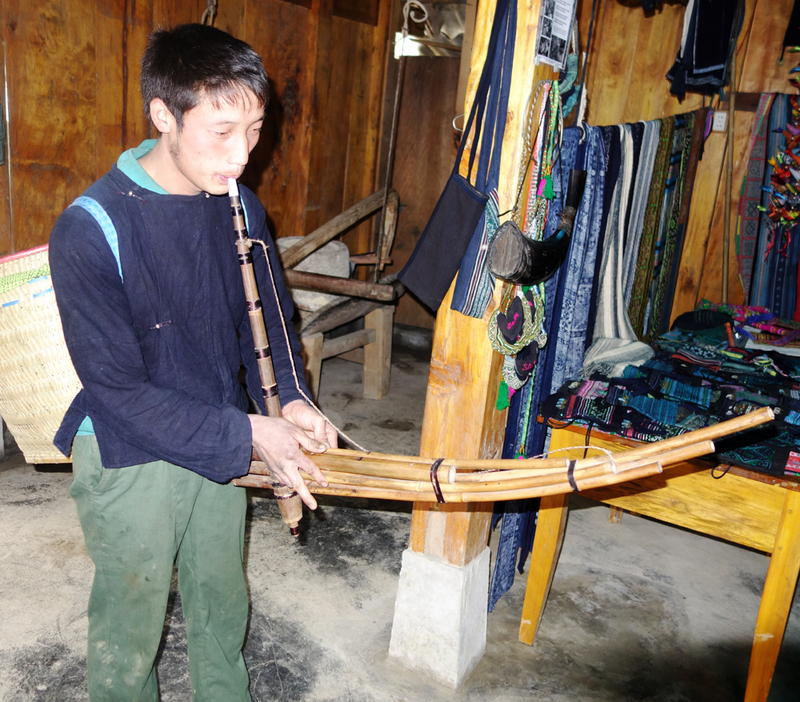 Our Porter played a traditional bamboo flute we came across in a weaving shop. It really had a smooth, almost lilting sound. 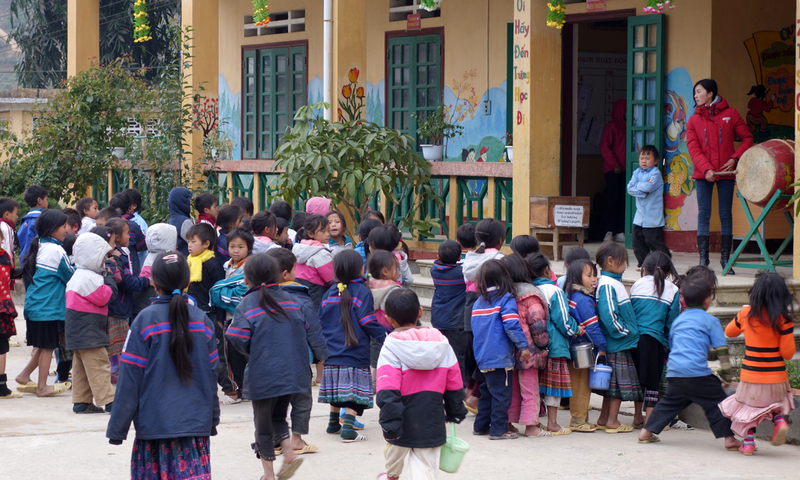 A public school with children primarily from the Dzay and Hmong tribes. We had fun interacting with them during their ‘recess’. They played an interesting game in the courtyard using old tennis balls, which were wacked by brooms made from rice stalks, until they scored in a soccer-like goal. 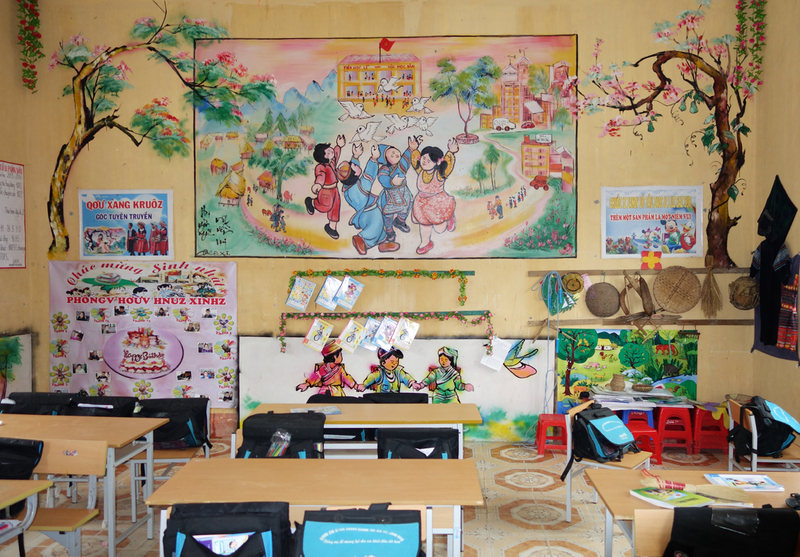 A very colorful classroom – schools are government-run and staffed, with additional funds supplied by various outside Ngo’s and foreign governments. 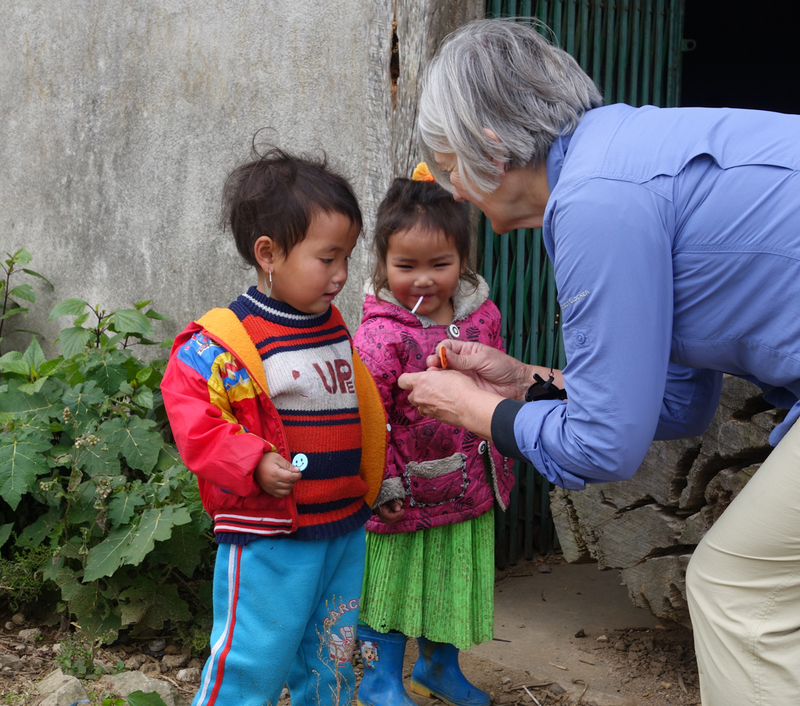 They teach the tribal children the Vietnamese Language at the expense of any instruction in native languages or dialects, of which there are many. Reminds one of the old US Govt. approach at ‘Indian schools’ back in the day . 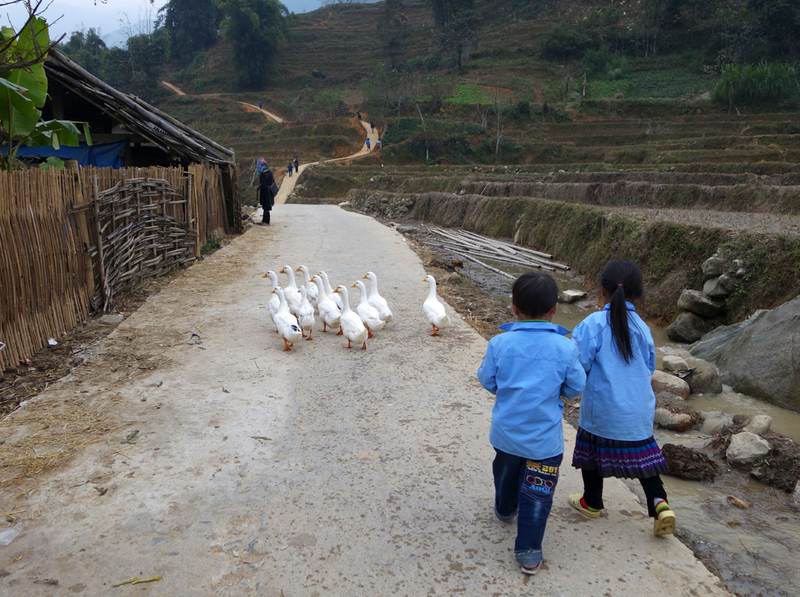 . .
Great company on the roads, these children would follow us (or the geese) laughing for awhile on their way home from school. 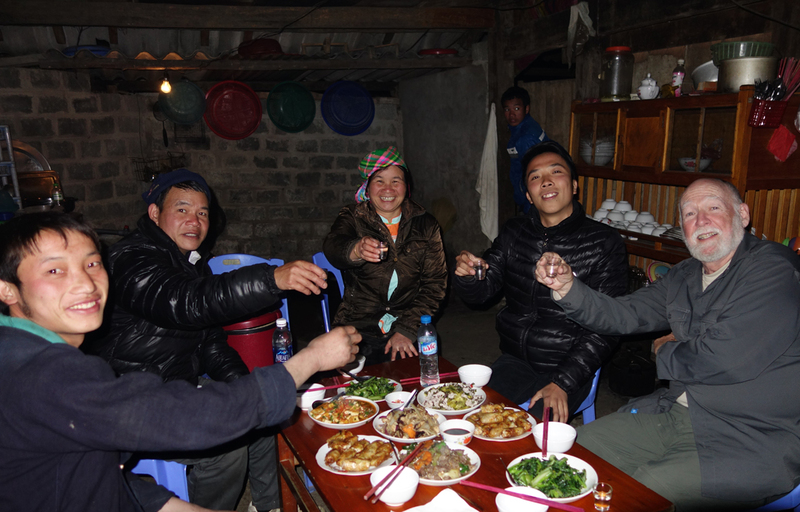 We had a lovely home stay with a husband and wife from the Dzay ethnic group. 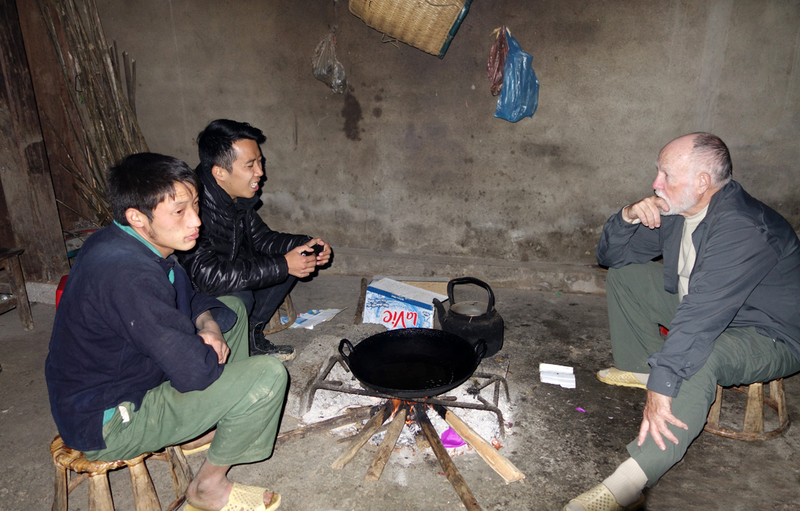 They have been providing these home stays for people trekking in the mountains for the past 18 years. The husband did most of the cooking the evening we were hosted, and we had a sumptuous feast with them, our guide and our porter. It was cool as the only heating was the fire for cooking. With several blankets we were able to sleep well, though the temperature dipped into the upper 30’s that night! Our feast and a rice wine toast. Or, actually about 10 or 15 rice wine toasts – – – lost count. Keeping warm by the fire while engaged in an interesting dialogue about government polices and their impacts on tribal peoples. While not entirely open with “farang”, they will tell you what they think when asked directly, though it may take a bit more rice wine to get an honest assessment of their opinions. Our hosts for the evening in the village we stopped in. 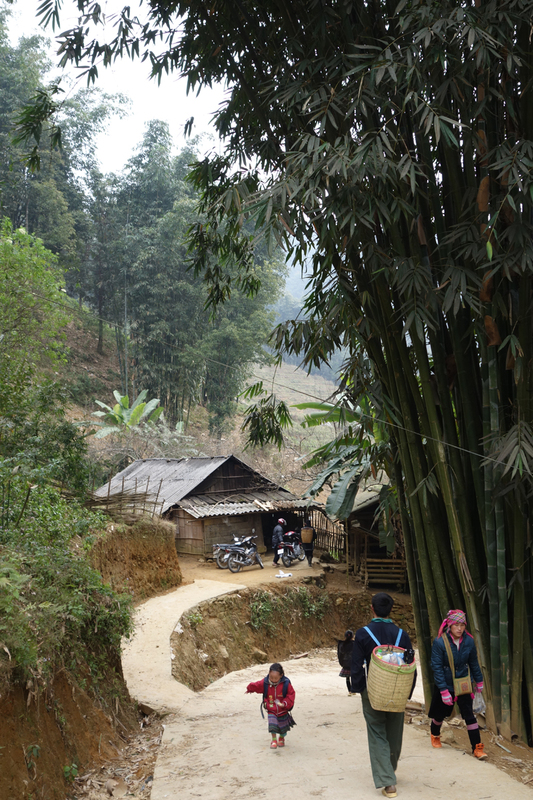 Another trek the next morning through rice fields and into the Ta bamboo forest. 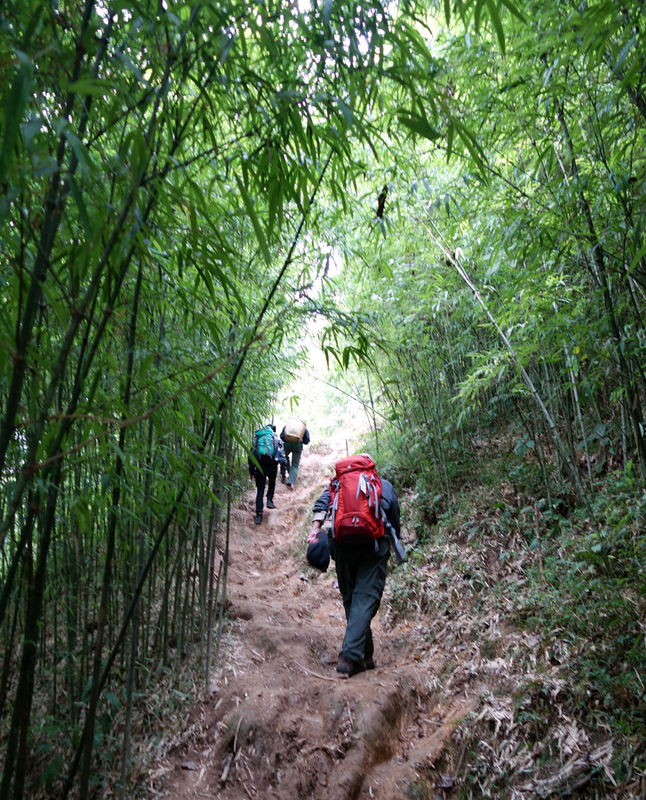 Our porter, who carried our lunches and water and a few pieces of gear for us, opened a stalk of bamboo along our path and brought out 2 sleeping bats for us to see. He then returned them to their hiding place in their bamboo ‘cave’. He (his name was “Joh”) didn’t speak any English, but he had the most beautiful smile. Gary carried along a small printer in his pack to give folk hard-copies of images he took of them, and Joh was delighted to receive a picture if himself. A small village on the trek, with Joh, our porter in the foreground. 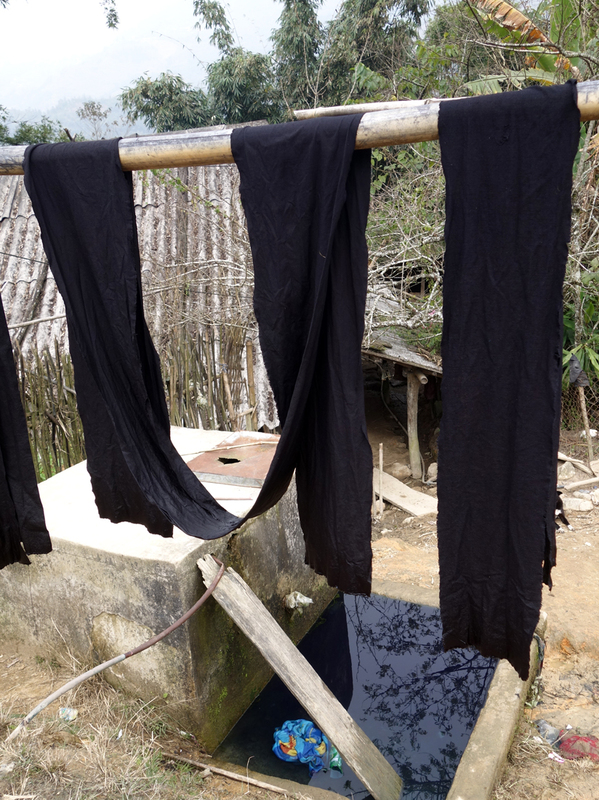 Black Thai cloth, recently dyed from the famous indigo plant, and drying in the sun. 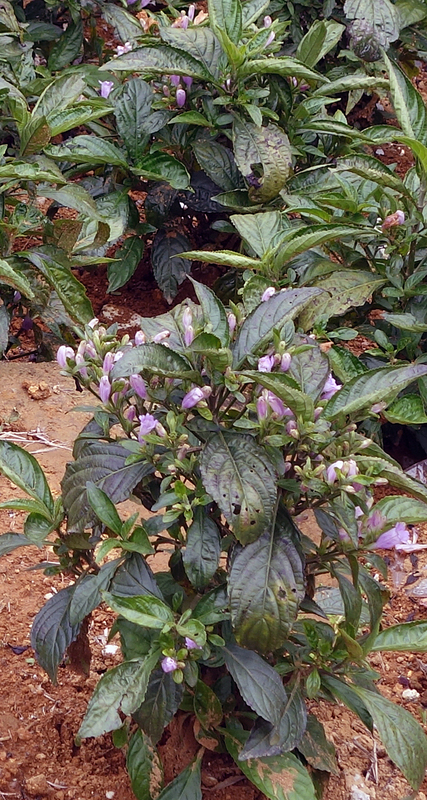 The dye is obtained from processing the plants leaves..
Indigo Plant used for the blue/purple dyes common amongst the Black Tai People. 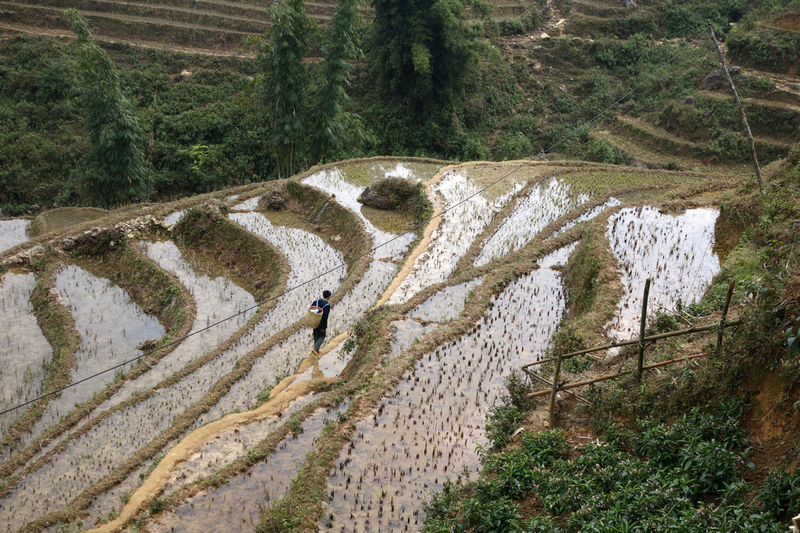 more rice fields – our porter taking a short-cut. Slippery trail. And this is the DRY season! Takin’ 5 along the trail. Notice the girl in the far right of the image? After she passed us, Evie decided her backpack wasn’t all THAT heavy anymore. Bamboo forest. Eerie feeling the more we travelled through these dark corridors. 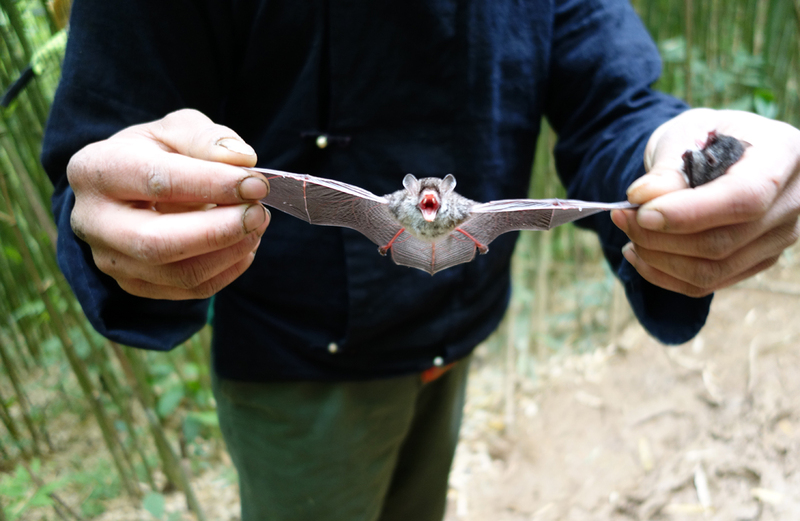 A couple of bats our porter pulled from a bamboo stalk. 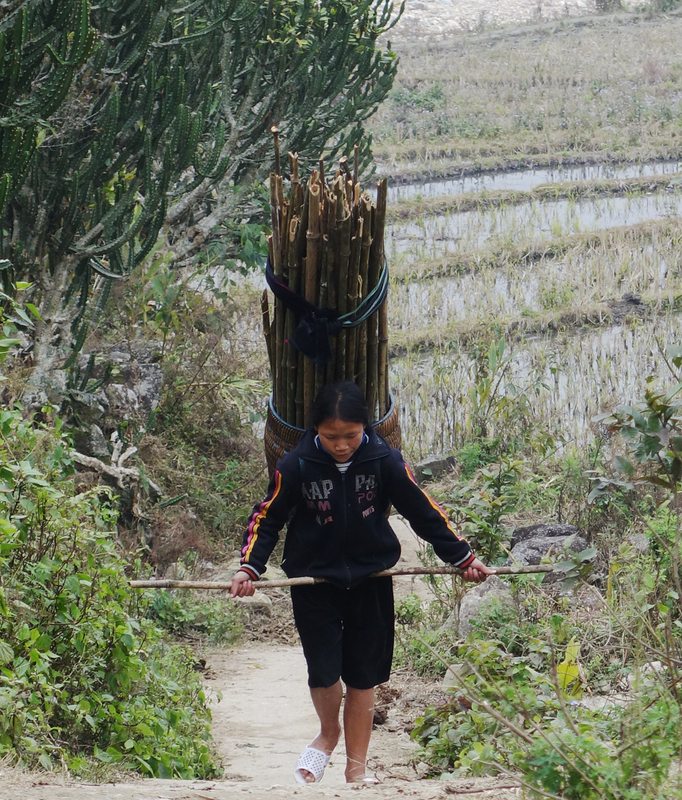 This young lady was gathering a load of bamboo for her family, and climbed down the far side of the mountain as we watched, then passed us on the up-side . . . Giving some stickers to two beautiful young girls along the roadside. They giggled and immediately went inside to show their father. 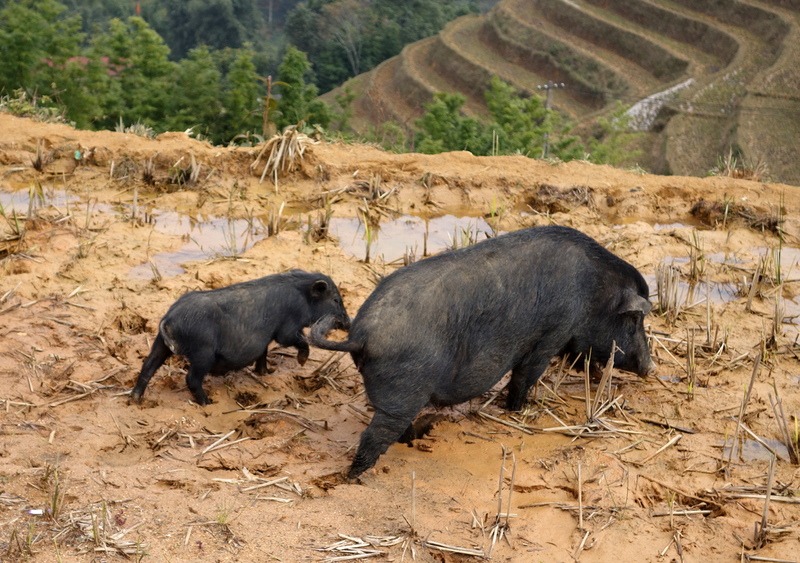 Local scavengers after the rice has been harvested. After trekking about 8 more kilometers, most of those on a dusty road,, we decided to go back to town rather than continue on to another village at the far end of the valley. 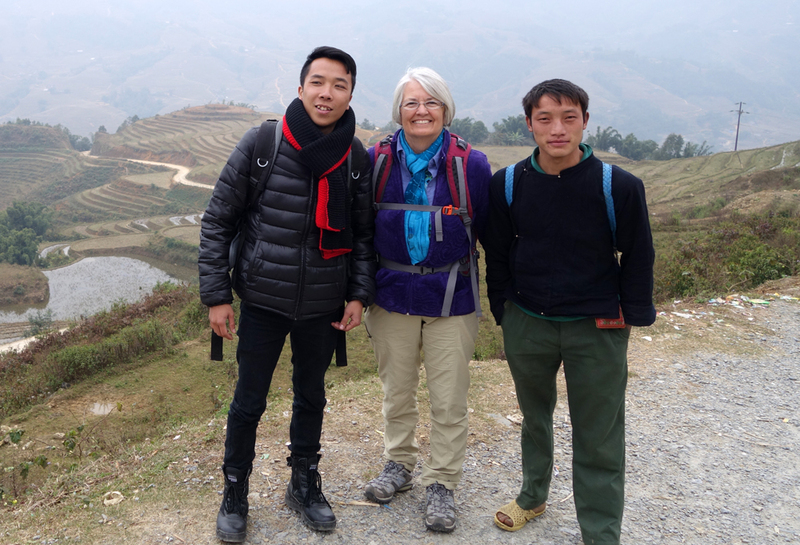 The weather was very cloudy and we weren’t having a lot of interaction with the local people like we expected in the more isolated villages we had hoped to be hiking in. 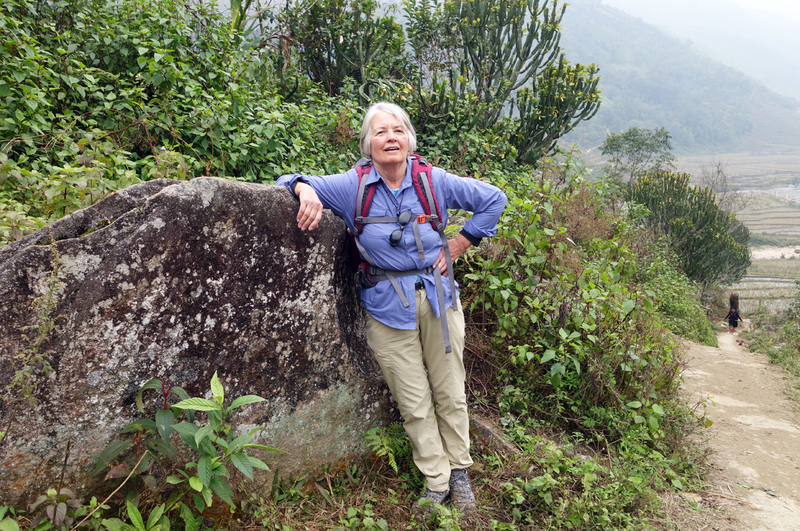 Many of the women follow trekkers for sometimes great distances, and then expect you to but something from them. 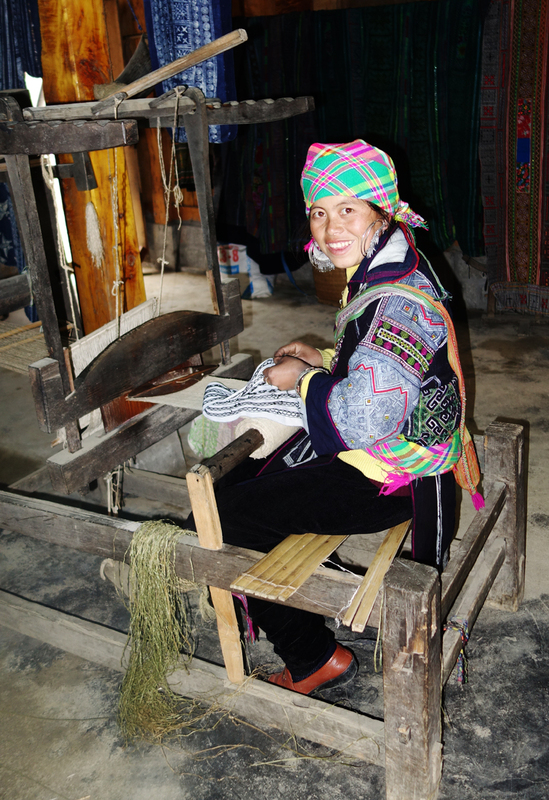 There can also be very young children employed that don’t then get to attend school, trying to sell woven bracelets and other crude trinkets — so sad. It was difficult to watch. This is a magnificently beautiful area. 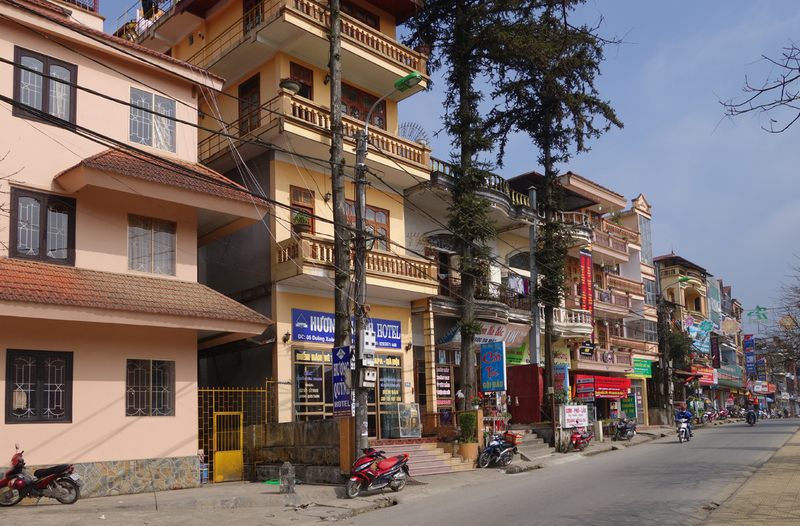 Yet, the roadsides and trekking routes are beset with litter. It is primarily, we found, the result of a culture locally that is used to throwing whatever they don’t need or use away because they use so much of the natural stuff such as banana leafs for cooking food or dishes. Hence, it will take time and education to change the habits engrained. Almost seems like they need to advertise some treks just to pick up litter. This is only going to get more crowded with tourists, and we heard more than a couple of groups, from Europe and Australia primarily, comment on the fact that if it gets worse, many of their country-folk would likely stop touring up here . . . 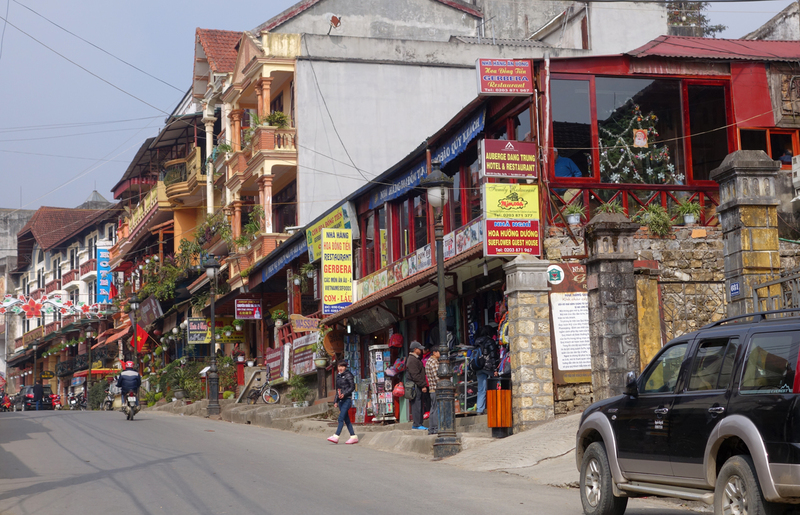 So instead of Christmas Eve in a village, we spent that wonderful evening in the town of Sapa which, upon closer inspection, looked like an Asian version of the French Alps to us! A large portion of the population here are Catholic. At the large church there was a party going on with food and music for this ethnically diverse population of children, who look forward to this Holiday season no matter what their religious preference. It was delightful to be a part of this celebratory atmosphere, complete with a Santa Claus!! We had a delightful Special Christmas Eve dinner at an Italian restaurant owned be a Chinese-Vietnamese chef. 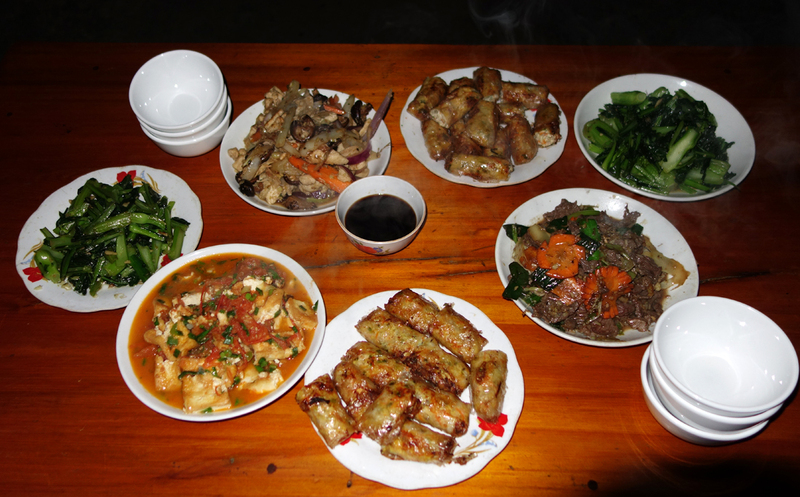 There were large parties of local Vietnamese celebrating Christmas with tourists from all over the world. It has been a strange Christmas Season indeed for us; being in Vietnam and not being with family. Enjoying the sunshine on Christmas morning outside a French Bistro. Amazing things they carry. Janice you have the exact, same picture! Do you think they drive them around so we tourists to take their pictures??? Gary had to take this picture of “Uncle Ho”. 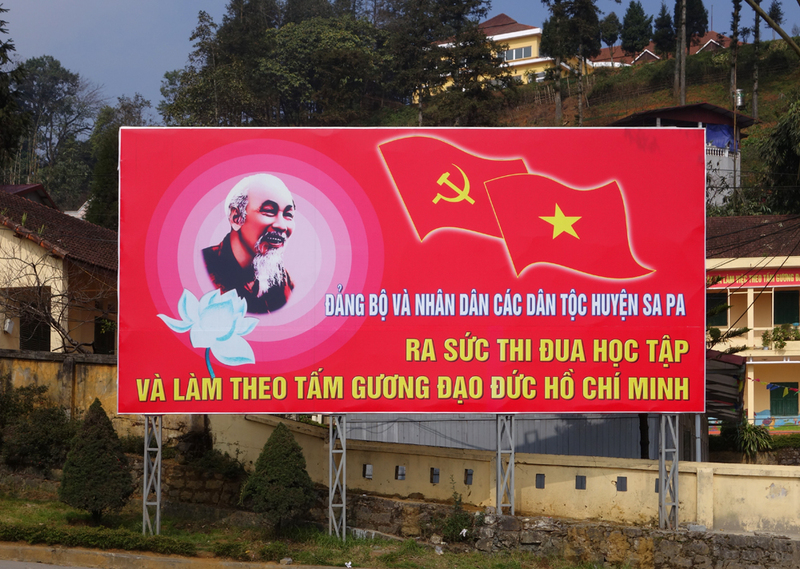 Not certain of the message, but intent is clear: he is very much alive and well in ALL of Vietnam. Christmas morning and Sapa is totally fogged-in and turning colder. Definitely the right decision to come to town yesterday, but we were disappointed not to be able to spend more time with some of the minority ethnic groups in the more remote villages. Maybe next trip? 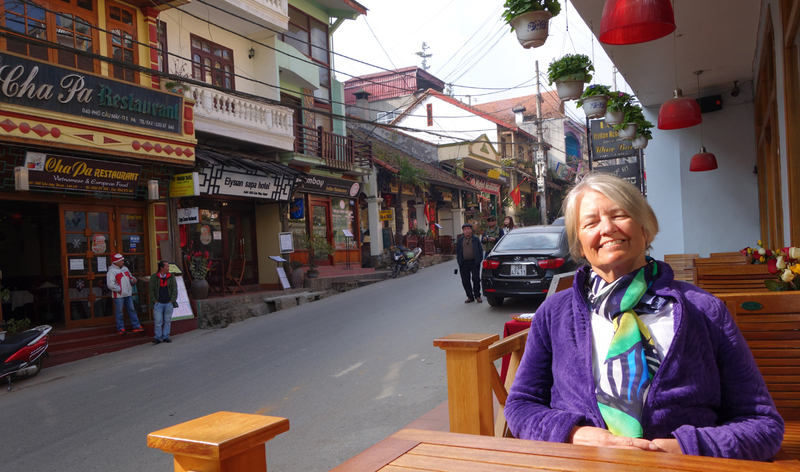 Another walk around town and then back to Cai Lau to climb aboard that self-same night train back to Hanoi. 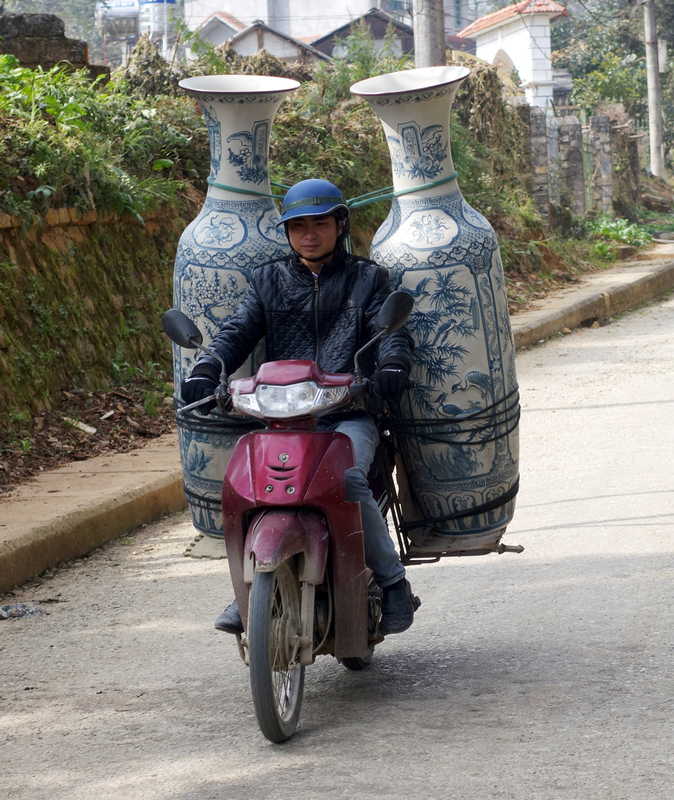 and with that, a goodbye to Vietnam and on to our next adventure……. in Laos. 2 happy retirees, movin' along . . .
Looks like your stamina is holding up. Enjoying your great pictures and writing.